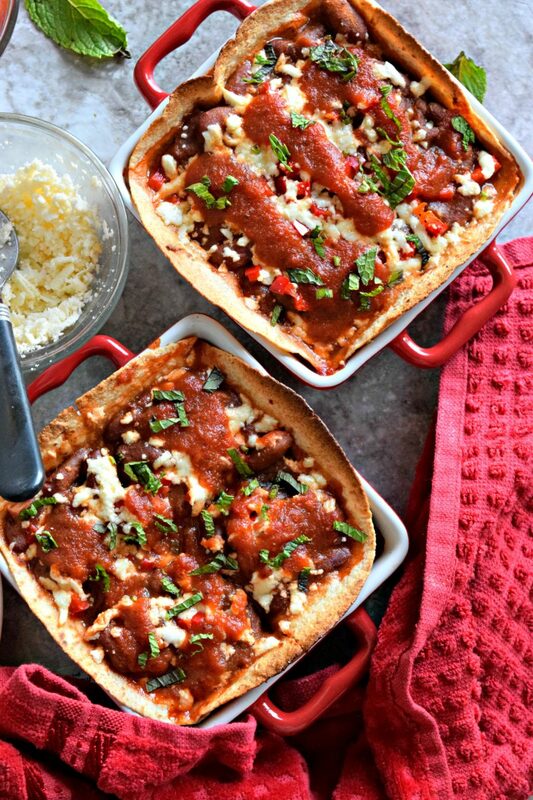 Rajma/Kidney Beans Enchilada Mini Casserole is a perfect weeknight dish! 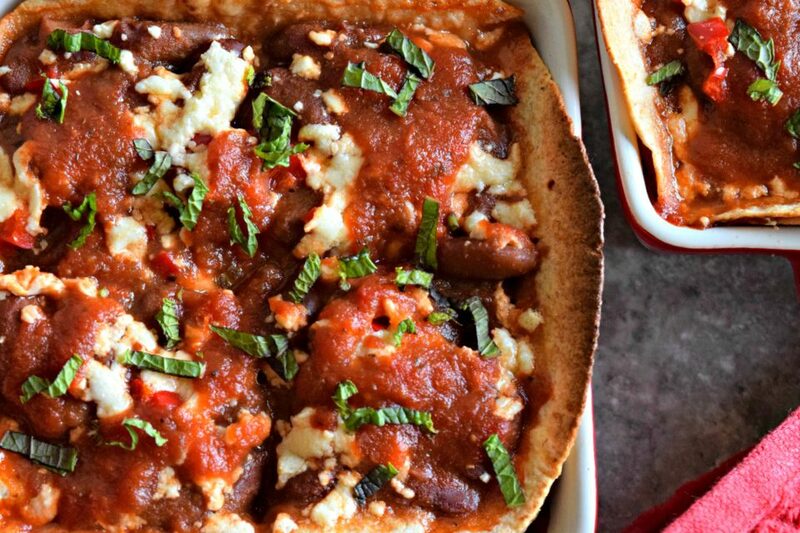 Beans, cheese, tortillas & sauce are the ideal ingredients to make a delicious meal. The first time I ever tasted an enchilada in my life was way back in college. The world cuisine was just making its entry into the Mumbai food scene and the local restaurants began serving dishes like pasta, tacos, enchiladas and pizzas to name a few. Everyone was gung-ho about Mexican food so me and my friends decided to try this cuisine out for ourselves. It was a newly opened restaurant near our college. Everything looked fancy and smelt new. The interior was tastefully done which made it stand apart from others. It was since then that I started preferring modern contemporary interiors over traditional and that is why I can vividly remember that restaurant even today as if I went there just yesterday. The food we ordered also is etched in my memory as I was blown away by these new flavors. For a girl who had eaten Indian food all her life, this was a major game changer. I had never eaten kidney beans/rajma cooked this way and that is what intrigued me the most. Between the 5 of us, we ordered nearly every Mexican food on the menu and tasted it all. However this Bean Enchilada and Tacos stood out for me. And since then we have ordered this dish many times. 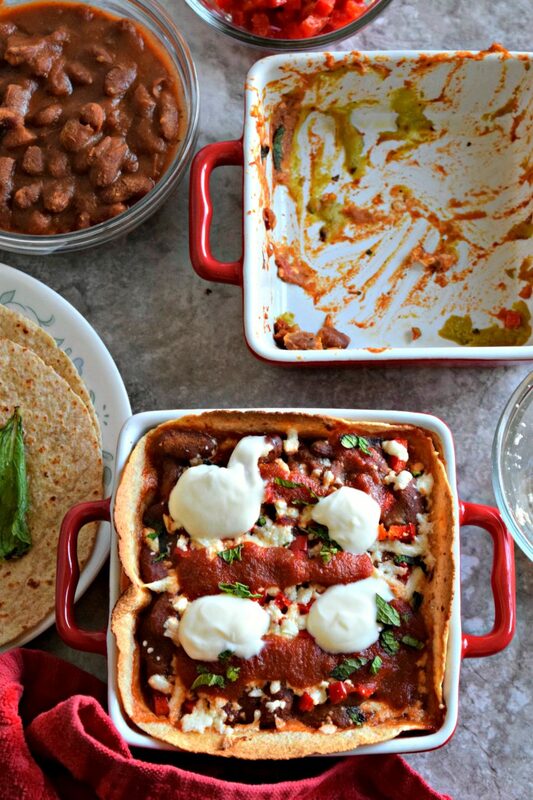 Recreating this Rajma/Kidney Beans Enchilada Mini Casserole bought back all those wonderful memories. and cook it for 2 minutes. to the pan. Mix it all together lightly and carefully else the beans will get mashed. Cook it for a minute or two. Take it off the pan. Preheat the oven to 400 degrees F. Take a mini casserole dish, add a spoonful of guacamole and spread it on the base of the casserole. Place a mini tortilla over it. Add some bean sauce over it. Then add chopped bell peppers and cheese. Place another tortilla over it and follow the same steps till the casserole fills up. I added up to 4 tortillas in total. Lastly add some sauce that was preserved. Bake this casserole for 10-15 minutes or until the cheese melts. Rajma/Kidney Beans Enchilada Mini Casserole is ready! Garnish with chopped cilantro and mixed herbs. Add some sour cream on top as well. Allow it to cool a bit and then dig in. This is such a fun way to enjoy this dish. Every bite, transported me back to my college days. This dish holds a special place in my heart and it got me more close to world cuisine and opened up many possibilities. 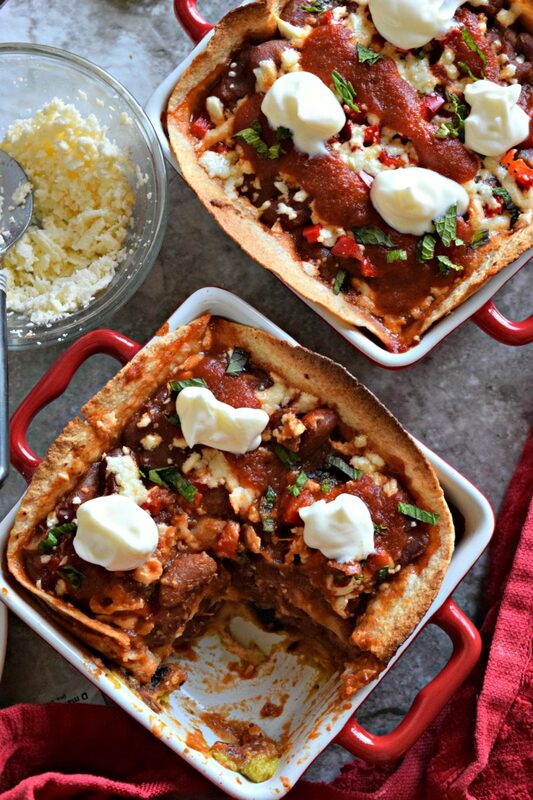 The sauce is perfectly tangy and spicy, the beans are juicy and the tortillas are moist. All in all, a winning dish. Serve this as single servings for lunch/dinner/brunch. Dry roast the garlic cloves and tomatoes separately. Let it cool down a bit and then grind it to a smooth paste along with green chillies. In the same pan, add tomato puree and cook it for 2 minutes. Then add the ground tomato-garlic paste to the pan. Bring it to a boil and reduce the flame to a medium. Add salt, coriander-cumin powder and mixed herbs to the mix. Mix and cook for a minute. Take out a cup of this sauce and preserve it for later use. Then add boiled rajma/kidney beans to the pan. Mix it all together lightly and carefully else the beans will get mashed. Cook it for a minute or two. Take it off the pan. Preheat the oven to 400 degrees F. Take a mini casserole dish, add a spoonful of guacamole and spread it on the base of the casserole. Place a mini tortilla over it. Add some bean sauce over it. Then add chopped bell peppers and cheese. Place another tortilla over it and follow the same steps till the casserole fills up. Lastly add some sauce that was preserved. Bake this casserole for 10-15 minutes or until the cheese melts. Rajma/Kidney Beans Enchilada Mini Casserole is ready! Garnish with chopped cilantro and mixed herbs. Add some sour cream on top as well. Allow it to cool a bit and then dig in. Try using regular chapati instead of tortillas as a variation. Loved this recipe? Don’t forget to check out some other international recipes on the blog. I had done a whole month of posts dedicated to world cuisine. You can read it here. Some other recipes that I think you would enjoy are Lebanese Rice With Vermicelli, Moroccon Eggplant Zaalouk, Pakistani Aloo Bharta (Spiced Mashed Potatoes), Teriyaki Noodles with Broccoli & Beets and Korean Pancakes/Pajeon. This is a casserole that I need to make very soon! It looks tasty! This casserole has all of my favorite things! 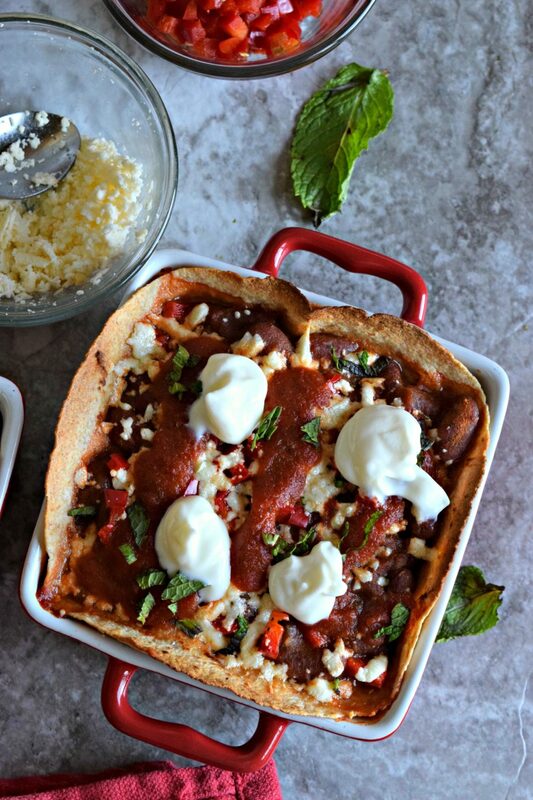 Vegetarian style Mexican dishes are the best! Oh my! This casserole is a must-try! My family would devour this! And it looks way easier than rolling enchiladas. Yum! I love enchiladas! I first had them in college too. This is perfect for Meatless Monday!